Raspberry Swirl Muffins – Make Fruit Fun! We all know how difficult it is for the little ones to eat fruit and vegetables. Jenny from Lunchbox Doctor has some fantastic ways to get you and your kids involved in food and become more adventurous! Go fruit picking. We are in prime raspberry picking season right now. Find your local pick your own (PYO) by doing a search on the internet. Get cooking. Below you will find a simple recipe for a raspberry swirl muffin that makes really colourful muffins. These are a great way to taste raspberries as well as having some cooking fun along the way. Grow raspberries from the seeds on the left-over picked raspberries. 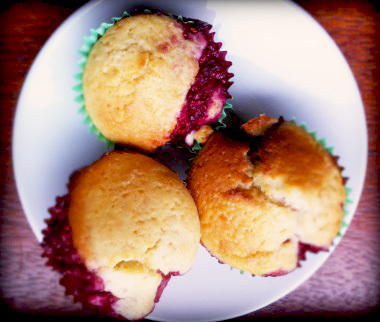 Try this recipe for delicious Raspberry Swirl Muffins! Put the raspberries in a bowl with the maple syrup and vanilla extract and mulch everything together with a fork. Beat together the melted butter, milk and egg then add the flour and baking powder until everything is just mixed. Spoon about 2/3 of the mixture into paper muffin cases. Add a layer of raspberry puree. Top with another small spoonful of the muffin mix. Bake in the oven for 12-15 minutes until golden. Cool on a wire rack and eat when they have cooled sufficiently to handle. Choose two ripe fruit then place in a sieve and rub off the pulp, keeping the seeds. Next, wash the seeds thoroughly so that all trace of pulp is removed. Put the wet seeds on a paper towel in the sunshine to dry. Place some seed compost in a small pot then add the seeds and cover with about an inch of compost. Press down on the compost then place the pot in a cool room where it won’t get any sunlight. Ensure that the pot is kept slightly damp but not too wet, otherwise the seeds will rot. In about December, a few seedlings should have appeared and they may keep appearing through the winter. When big enough to handle i.e. about 5-7cm high, carefully separate and put in small pots. Later, when the plants are big enough to fend for themselves you can put them outside, ideally in a cold frame first then in the soil. It may take years for the plants to grow big enough to fruit abundantly but the process has begun and children can learn that this is how things can grow from seeds. Thanks to Jenny at Lunchbox Doctor for all her fabulous tips for making lunchboxes healthier and a lot more fun!